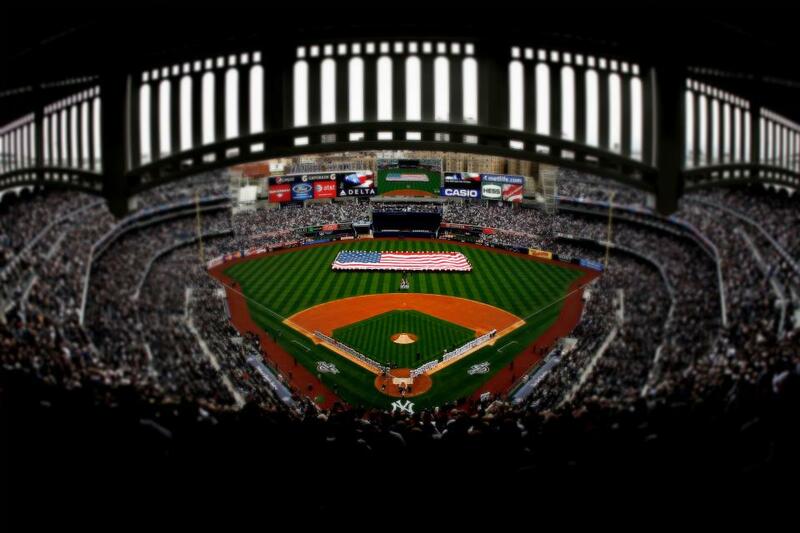 All the wonderful elements of the Yankees’ home opener this afternoon against the Los Angeles Angels of Anaheim. What sweetened the whole deal? 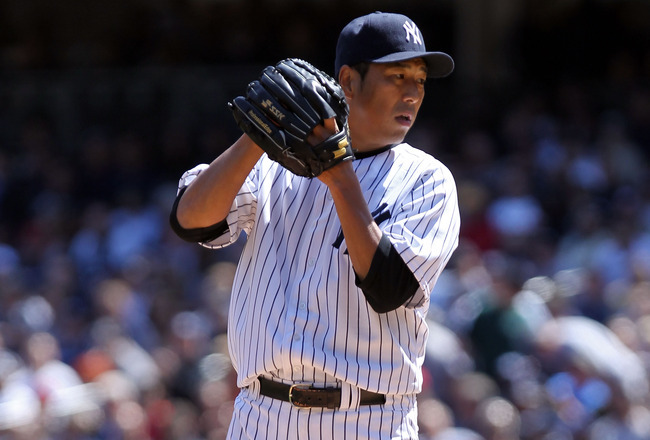 A 5-0 shutout of the Halos behind a brilliant outing from new Yankee Hiroki Kuroda. The Japanese-born starter twirled an absolute gem, tossing eight-plus innings while not allowing a run. Kuroda allowed just five hits, walked two, and struck out six. Talk about a fine way to introduce yourself to the Yankee faithful. Kuroda probably would have finished the game had he not given up a leadoff infield single to Bobby Abreu in the top of the ninth, but he was at 109 pitches, therefore gave way to David Robertson. Robertson got Albert Pujols to ground into a 6-4-3 double play before fanning Kendrys Morales for the final out. Kuroda and Robertson were backed by a solid amount of run support, started by a bases-clearing double off the bat of Nick Swisher in the bottom of the first. The two-base hit plated Alex Rodriguez, Robinson Cano, and Mark Teixeira. Up 3-0 in the bottom of the third, Rodriguez added a run with one swing. The slugging third baseman crushed a leadoff home run deep to centerfield, a shot that landed in the netting above Monument Park. With that homer, A-Rod tied his former Seattle Mariner teammate Ken Griffey, Jr. for fifth place on the all-time home runs list with 630 career round-trippers. Curtis Granderson put the icing on the cake with a screaming line drive bullet home run over the right field wall in the fifth. Granderson’s solo blast gave the Yanks all the offense they needed to put the Angels away and boost their win streak to four. The Yankees couldn’t have asked for more out of their number two starter. The bullpen had thrown 11.1 innings in the final two games the Bombers played in Baltimore, and after an off-day yesterday, the relief corps basically received another day of rest. Length was key, and Kuroda gave the Yanks more than enough. It was a nice rebound start for Kuroda, having given up six runs in 5.2 innings in Tampa Bay last Saturday. He used his fastball to his advantage and his slider was dancing all over the strike zone. Not even the mighty Albert Pujols could figure Kuroda out. He didn’t utilize his split finger much, but he didn’t need to; he neutralized the strong hitters like Pujols and Morales without giving an inch. In Japan, the best pitcher on the staff wears the number 18. Kuroda chose to wear number 18 upon his arrival in the Bronx and today he earned the right to wear that number. A crackling fastball, a moving slider, six K’s against a deep Angels’ lineup, and a win – that’s enough to sell me on him. Now at 1-1 on the year, he will look for his next win Wednesday at home vs. the Minnesota Twins. Manager Joe Girardi chose to bat Alex Rodriguez third in the lineup today. Having only collected three hits in the first five games of the season without knocking in a run or hitting a homer, it was clear A-Rod needed to move from the cleanup spot on account of lack of production. All that changed today. The move clearly had an impact. A-Rod went 3-for-4 this afternoon and belted his first home run of the year, a bomb that landed in Monument Park – not a cheap homer. With the home run, Rodriguez tied his old buddy Ken Griffey, Jr. for fifth place on baseball’s all-time home runs list. It was A-Rod’s 630th career homer. He also raised his batting average from .174 to .259. That’s the beauty of baseball: one day can turn everything around. 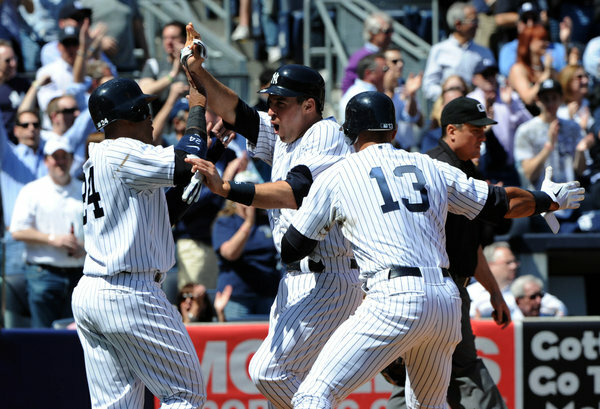 The Yankee right fielder is becoming a valuable asset to the team in the early-going. Nick Swisher has reached base in every game this season. He’s hit safely in six games and in the one game he didn’t reach base by way of a hit, he drew two walks. Last Saturday against the Rays, it looked as though the Yankees were done in the ninth when Swisher stepped up to the plate. He proceeded to cream the ball for a home run to keep the Yankees alive, although they eventually lost 8-6. In the series finale at Camden Yards vs. the Orioles, Swisher came up huge with what proved to be the game-winning home run, a two-run blast that gave the Bombers a 6-4 lead they held onto for the victory. Today Swisher had the huge double in the first to clear the bases and give the Yankees an early lead and a ton of momentum. So far this year Swisher has two homers, nine RBIs, has seven hits, has drawn five walks, and has scored three runs. 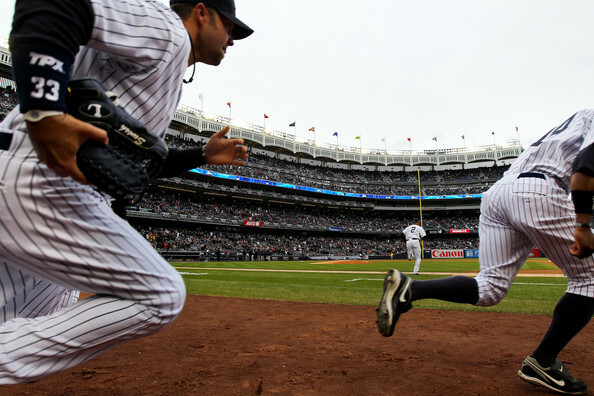 If there is a Yankee hero at this moment, it’s Swisher. Right now, he can do no wrong. 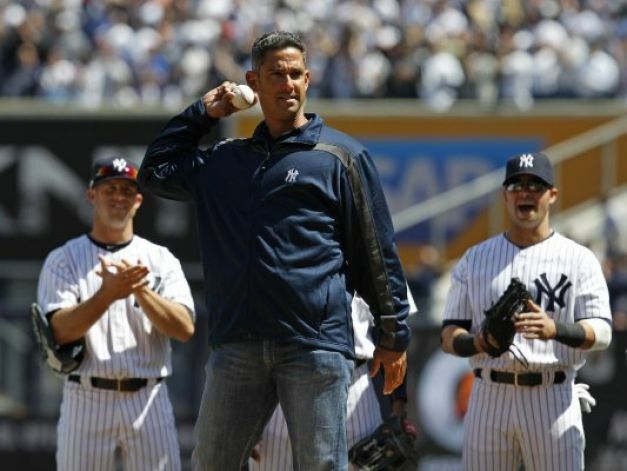 A special dignitary tossed out the honorary first pitch this afternoon: recently-retired catcher Jorge Posada. The Yankees stood behind the mound out of respect to their former teammate and watched as he threw out the ceremonial first pitch. There was a lot of speculation as to what was going to transpire during this particular part of the Opening Day festivities. I had heard a rumor Posada was going to go to the mound, then one of his teammates would switch with him – and he would actually catch the honorary pitch rather than throw it, because that’s what he is most known for in Yankee lore. While his teammates and family watched, Posada threw the first pitch to his dad who stood behind the plate to catch it. Following the first pitch, Posada emotionally hugged each of his Yankee friends. It was a touching moment and Posada received a well-deserved standing ovation from the Yankee Stadium crowd. It was a promising win for the Yankees. The Angels are the only team with a lifetime winning record against the Bombers and with the additions of Pujols and starter C.J. Wilson (who the Yankees will get a look at tomorrow afternoon) they only got stronger; more difficult to beat. But they got beat today – stifled by a lights-out performance from Kuroda. Curtis Granderson’s bullet home run marked the second year in a row he has gone yard in the Yankees’ home opener. 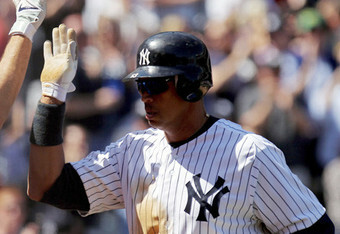 He homered last year in the Yanks’ win over the Detroit Tigers at Yankee Stadium. Phil Hughes toes the rubber tomorrow against the Angels, gunning for win number one on the year. Hughes threw the ball well in his first start on Sunday in Tampa Bay, but came up just short. 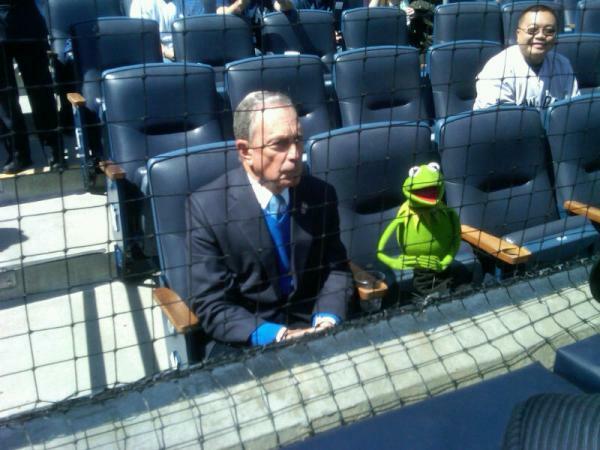 He will look to pick up his first win and roll the Yankees’ win streak over to five games. 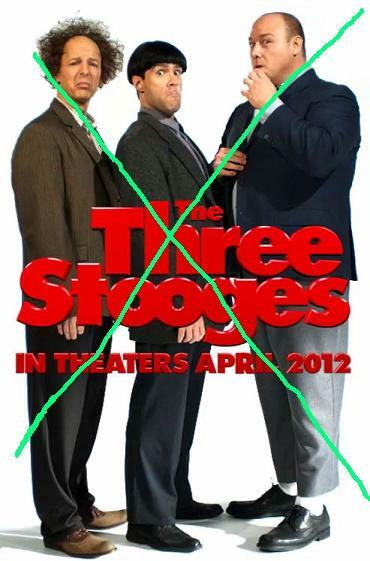 On a side note, is anyone else growing tired of the promos for the new “3 Stooges” movie?